Zone 3. Very hardy but sensitive to late frosts. Excellent for moist sites. Hummingbird plant. Keep moist. Remove faded flowers for extended bloom. Benefits from winter mulch. Absolutely stunning! This is an exceptionally handsome flower that enjoys a moist shady area. It is a native species found in low lying woodland openings. The plant forms an attractive basal rosette of leaves. Brilliant scarlet blooms form on 3 foot spikes in late summer through fall. The late season, intense color is a real plus and is attractive to butterflies and hummingbirds. Cardinal flower is very attractive planted in masses. Mulching over the winter is recommended by many references. New plants should be spaced 10 to 12 inches apart. Division is needed only every four years or so. Mulching with a loose materials such as straw will help plants through the winter. 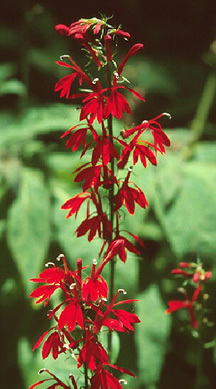 Cardinal flower will self sow if conditions are correct. The seedlings are extremely small at first, but once they obtain some size, are easily recognizable.